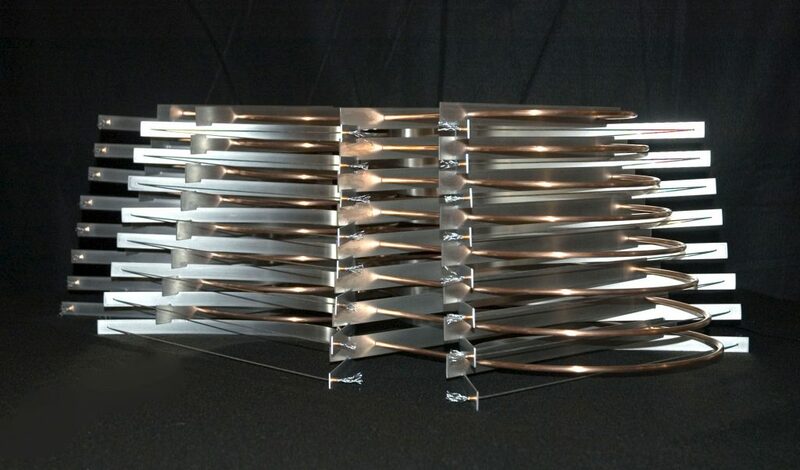 Connie R. Campbell, Series II #10, 2018, Aluminum, steel cable, and copper, 12 x 22 x 40 in. One of two exhibitions currently on view in Rosewood Gallery is Archetypes, a series of sculptures by the artist Connie R. Campbell. Campbell is also the former Cultural Arts Superintendent for the City of Kettering – she was the very first to develop programming for Rosewood Arts Centre, among her many other tasks during her tenure with the City. Connie talked with us recently about her creative process, artmaking since retirement and what she has enjoyed about returning to Rosewood Gallery. How long did you serve as Kettering’s Cultural Arts Superintendent? Can you explain briefly what your role involved? It was my great privilege to work for the City of Kettering as Cultural Arts Superintendent from 1985 to 2012. I was hired as the first full-time staff for the arts to develop programming at the newly opened Rosewood Arts Centre. Other duties along with the new art center included organizing the summer concert series, supervising the needs of the Kettering Civic Band and the Kettering Children’s Theatre. Over the 27 years that I held that position, I was fortunate to be able to work with a very dedicated and highly talented staff who assisted in providing the community with outstanding art education opportunities, public art programming, the fantastic Fraze Pavilion and fine arts festivals and performances. All of this could not have been achieved without the encouragement and support that was given by the Kettering Parks, Recreation and Cultural Arts administration, Kettering City administration and the leadership of the Kettering City Council. Did your time with the City/Rosewood help to shape or inform your artwork or creative process? Prior to my position with the City of Kettering, I was a working and exhibiting sculptor. I had developed my work from a series of large-scale sculptures and outdoor installations. There were a number of committed exhibitions that I worked through the first few years while developing programs for Rosewood Arts Centre. It was necessary for me to stop producing my art and focus on art administration. My current work is an extension of those early sculptures. I strongly believe that the future of art is in the community. Developing public support and interest in the arts became more important to me than producing my sculptures. Now that I have retired and have passed this daunting task to the incredibly capable hands of Shayna McConville and her fantastic staff, I am able to continue my personal creative process with an energized direction. What has been your artistic focus since retiring? I have worked with black and white photography and darkroom development, but I am a three-dimensional thinker, so my artistic focus has always been sculptural. My sculptures are produced in series with measurements derived from golden section ratios. The forms themselves are derived from the previous sculpture and what can be done with repetitive lines created by tension. The forms tend to lend themselves to an architectural character. Given your history at Rosewood, has preparing for an exhibition there been a different experience than showing work elsewhere? Definitely. It’s home to me every time I walk in Rosewood. I love the gallery and have so much respect for the artists who show there. It is a fantastic space for exhibitions. When I walk through the halls, I see what Shayna and the staff have done to progress the center to a remarkable and energetic place for art. 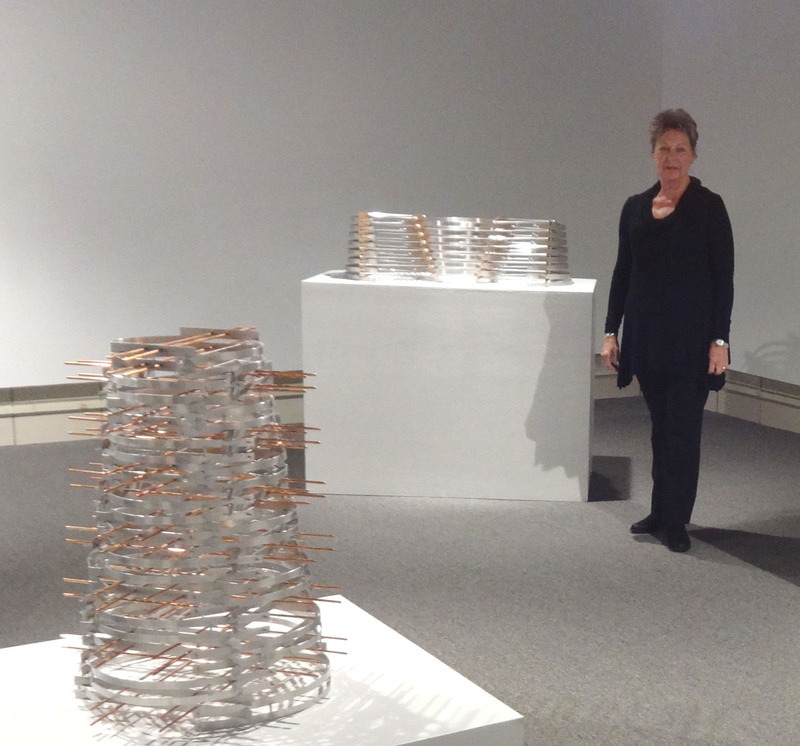 Gallery Coordinator, Paula Kraus has been outstanding to work with during the exhibition preparation. It is truly heartwarming to be on the other side of the programming. What do you hope viewers take away from your exhibition? I hope that they will find the work interesting and get some pleasure in looking at the sculptures. Learn more about Rosewood Gallery.